Last weeks Tasty Tuesday experiment was a huge success!! From many of you, I heard from that you received comments and visitors that do not normally occur, so thank you for taking my request to heart and sharing the visit love. I was so thrilled to hear that since I am all about creating community here at Balancing Beauty and Bedlam. I will continue to do the image linky because people loved it , (but maybe not every single week). I like to surprise you all. Some friends want to know the title of the recipe, some the blog name, but I have no preference, so it’s completely your choice how you title it in 20 characters. As always, Please link directly to your recipe post and not your blog URL. Also, link back here so that everyone can join in the fun. I’m all about fun. I can’t to see what you were all cooking in the kitchen this week. I think the pics are so much fun, and I already see EXACTLY what I needed today. Yay! I still keep putting my name instead of the name of the recipe, but other than that I’m loving the new links! (And that isn’t the fault of the links, it’s me making the same mistake every time – doh!) Hopefully next week I’ll get it right 🙂 Anyway, thanks for hosting! One of these days I’m going to get around to joining Tasty Tuesday! For now, I’ll enjoy looking at some of these yummy recipes. I am SO GLAD to hear that there was more “visiting” after your appeal last week! I like to think that the trend of “linking and leaving” is being halted, at least a little. It’s so much more fun to get to know people! Thank you for hosting these Tuesday parties so faithfully. Hope you’re having a great week! I’m off to Bible study this morning, but will be back this afternoon to visit. 🙂 Thanks for hosting!! Hi Jen! 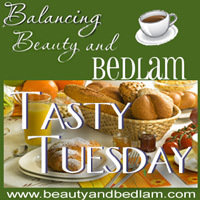 I love the NEW Tasty Tuesday Linky! It is great to actually see pictures of the food! It makes it more appealing! Thanks so much for hosting Tasty Tuesday! Have a blessed week! Oh this is so fun! I found you via “The Perks” and am looking forward to participating in the future! I’ve been away from Tasty Tuesday for a bit, but I gave you some linky love on my blog today, added the link to my Facebook page and left my Mushroom Barley Soup recipe on your blog. Awesome, and I can’t wait to try out some new recipes! I LOVE the pictures! This is great! I agree it looks more appealing. Hopefully I’ll usually have pics from now on! I’m back with another opinion. 🙂 This image linky definitely makes me click and visit more!!! Wow! This is so cool! I love it. Thanks for hosting . I love being able to see what I am looking at. Comments are the best, aren’t they! So much more meaning than those Google Analytics stats! LOVE the picture feature! Did you like the movie Under the Tuscan Sun? Do you love Italian? THEN, you have to SEE this recipe! You may even want to purchase her cookbook. Who knows? This is now my favorite meme to join because of the picture links. It makes it so much easier to visit new blogs and see the wonderful food! It’s my first time here, and I accidentally posted my name when I meant to describe my recipe, and I don’t have a cute photo…but I hope somebody will check out this yummy alternative to meat sauce anyway! Thank you for hosting this. I promise to come back and look at the recipes! Thank you for hosting again! I do like the pictures because they give you a better idea of the recipe – and some of them look irresistible! Thank you for this! I always get some great ideas! I am just trying to catch up with everyone after my knee surgery. How wonderful, the images are awesome. I hope to join Tasty Tuesday very soon. Love all your work you have been doing. I am so inspired and excited to see all the food photos. What a fantastic idea!!! I think there’s a better chance I’ll be trying some new recipes now! I like this new link thing. I haven’t been posting recipes lately, but I always enjoy looking for new ideas from these Tuesday posts. Thanks for doing this and for helping to create community. I so prefer the “photo” link on Tasty Tuesday. When I search links I get very aggravated wasting computer time on blogs and recipes that are not what I am interested in. Last week I was able to find a really good bread recipe by spotting a photo of 2-loaves of bread on the Tasty Tuesday photo link. Not only do I now have a really good Oatmeal Bread recipe but I really enjoyed browsing through the blog that posted the recipe! So, please consider keeping the photo link, it’s a time saver!